As we told you moments ago that the Google Play Games would soon introduce an Arcade section, it seems the feature is already live. After installing the Play games app version 5.5.72 manually, we had to clear the app’s storage data to get the new features. And guess what, they are awesome! Google Play Games 5.5.72 gives you two new sections at the bottom navigation bar: My Games and Arcade. What is on the ‘My games’ page is exactly — thus far — what you had on the previous version of the app at the outset. However, the Arcade section ramps up the fun — it can suggest you games you should play under the ‘You Next Favorite Game’ widget at the top of it, which features kind of filters you would want on the Play StroeStore app itself. Yep, it’s that good! 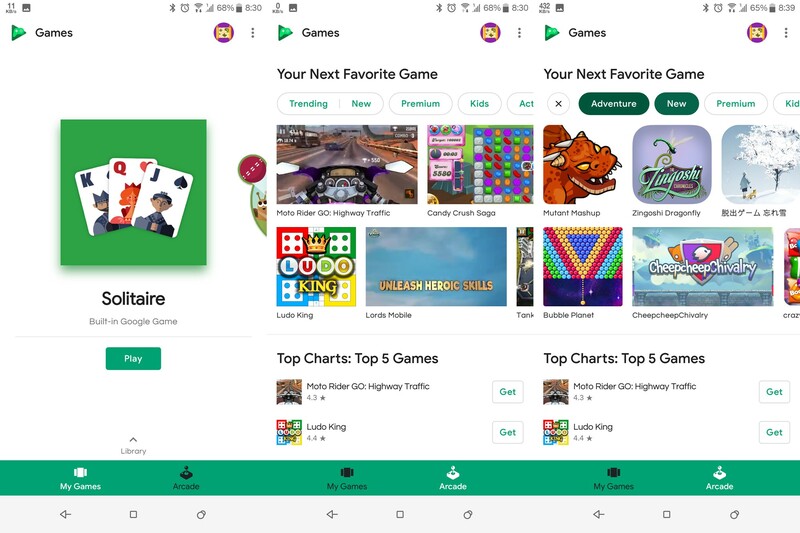 The Arcade section also features widgets like Top charts: Top 5 games, New Indie highlights, and more, while it now also houses the Google Built-in Games widget that Google introduced recently only, and was at the start of the Play games earlier. We really don’t think you would miss it at the homescreen of the app, and its inclusion here seems just right. Last section in the Arcade section is ‘Lookin’ for more, which gives you a link Games section of the Google Play Store app. Here’s a video that shows the new Arcade section of the Play games app in flesh.